The latest buzzword is Artificial Intelligence (AI) and Machine learning. You would have come across these terms in the recent days in magazines, news channels, online media etc. What is happening in the tech industry? Is it a process to replace human work force to robots? Let us understand more about Artificial intelligence. It is the ability of a computer, BOT or Robots to think and work like human beings are referred as Artificial Intelligence (AI) or Machine Intelligence (MI). It’s an advanced computer science which evolved after various research and studies on how human brain functions. AI is the next step in ever changing and growing technology field. Even though the AI applications are being developed for specific industries now but the scope is very wide and will reach out to all domains. 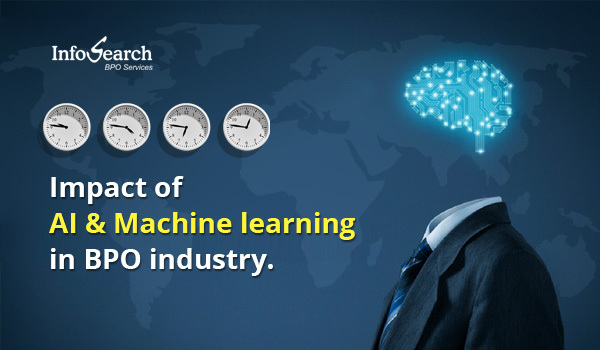 What is the Impact of AI in IT & BPO industries? The BPO industry itself was considered a threat and people feared job cuts when it evolved as a new line of business 15 years ago. There are mixed feelings, some say it’s a threat but some say it’s an opportunity to BPO to create support services like creating algorithms for the industry. Most of the reports predict impact only to repetitive and low skilled jobs. A recent survey predicts a 14% dip only on low level work force by 2021. The recent technological change of AI is already available. IT and BPO companies should gear up to cope up with the change by enriching their low skilled work force to be able to perform medium level skilled work by training and investing on technologies. Please check the recent survey conducted with attendees of Intelligent Automation, Chicago, 2017. 56% attendees had confirmed that they plan to partially automate 21-40% of their business processes using AI. Over 40% of attendees had confirmed that the major challenge in implementing IA is Standardization of processes before implementation. One more interesting finding is 68% of attendees confirmed that the FTEs will be redeployed in to more value-added work and 8% felt no impact on FTEs. The findings are a real console to the IT and BPO industry. In fact there will be new opportunities in form of process standardization related jobs. There are jobs already created by micro tasks websites like Amazon’s Mturk, Crowdflower etc. There will be huge demands for content moderation type of jobs in the near future. Change is the only constant. This is being proved time and again. The technological development of AI will not plunder the jobs but will only create new opportunities and improve the skills of the work force. Let us welcome the change for a better world.